Actually, it's more like 10 years of planning and construction (since ESA began running the project), then 10 years of mission (so far). Forgive me if this is a stupid question, but shouldn't the comet be emitting the gas trail? Or are we too close to see it well? And I imagined a comet would have lots of geysers on the surface, but I can't see any. Too much contrast -- the tail is very thin and faint compared to sunlight reflected from surface. Same reason you don't see stars in lunar surface photos from Apollo. Forgive me if this is a stupid question, but shouldn't the comet be emitting the gas trail? The gas is too thin and faint. The exposure was set to get proper exposure for the surface. You can't quite compare these emissions to geysirs on Earth. 16:03UT yesterday ESA was celebrating that Philae had fired the harpoons, they had been rewound and Philae was sitting on the surface. Apparently, nothing of this was true, but Philae seems rather to have been drifting away from the comet again at that time and bounced off the surface again a couple of hours later at an unknown location. There have been problems getting images and other data across, which perhaps is not strange if it was tumbling in space. It's a pity that the harpoons didn't fire, because they're also instruments. The celebration was a bit premature, and there's a bit worrying that ESA has so little information to share many hours after the (first) touchdown, i.e. they've been having problems interpreting what really happened, but chances are still good that a decent amount of data will be gathered. ESA will broadcast again from 13:00UT. The full panorama will be released in a few hours. Where is 67P/Churyumov–Gerasimenko in space engine? I do not see it in the "Find Object / F3" dialog. The ecape velocity is just below 1 m/s, which also roughly was the speed of the first impact. It bounced off the comet intact with less speed, of course, so it had to fall down again somewhere. Which is nowhere near site J, and I guess the name for site J will have to move to the place where Philae actually settled. The big bounce suggests that the surface is pretty solid, not so fluffy as some believed. Yet, the comet is lighter than ice, so it must be pretty porpous. The main drawback with the new landing site is that much less sunlight is received. That's why Philae brought harpoons. 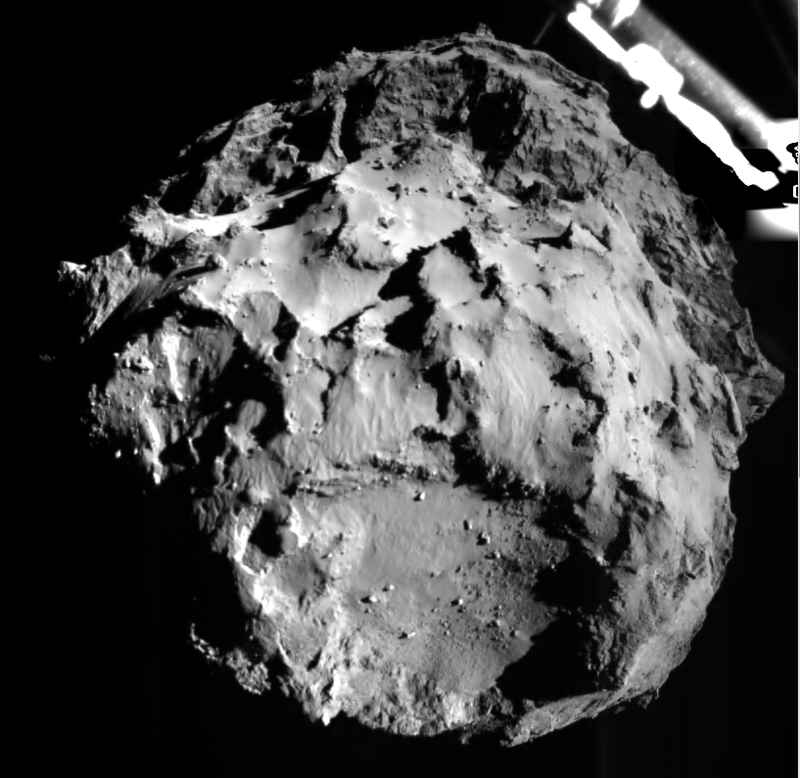 Philae finds carbon molecules in the comet! I also ask me whether I can find 67P?! Is he ever implemented??? 67P isn't in SE, it was probably overlooked when making the comet catalog, but it will be added in the future, or you can add it yourself.